I love owning my own bookshop. I get first dibs at great new books. I talk about books all day and enjoy mingling with fellow-booklovers. I have the chance to meet many great authors, the famous and the should-be-famous. But there is always a downside. On Saturday we’re hosting a mega-famous writer, and I have to admit to a bit of uneasiness. Renalta Van Markoff is the author of the hugely successful Hudson and Holmes series. She has a reputation for being a bit of a….shall we say, flake? Highly demanding, imperious, bossy. Her staff seem to live in fear of her. But she can turn on the charm when she wants to and her fans absolutely adore her. As for her books, I don’t care for them (overwrought and overwritten is my opinion). Critics are sneeringly dismissive, but her legions of fans (including Jayne Wilson from Mrs. Hudson’s Tea Room) can’t get enough. Serious Sherlockians, on the other hand, HATE them with a passion. Donald Morris, esteemed member of the latter group, was in the shop earlier today. He actually demanded (demanded!) that I uninvite Renalta. I can only hope that when she’s here on Saturday for what is looking to be a standing-room-only book signing, Donald doesn’t make a fuss. 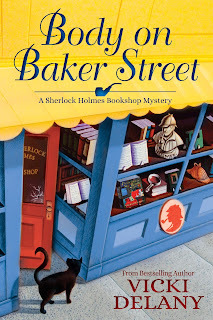 Body on Baker Street, the second in the Sherlock Holmes Bookshop series, will be released by Crooked Lane Books on September 12. 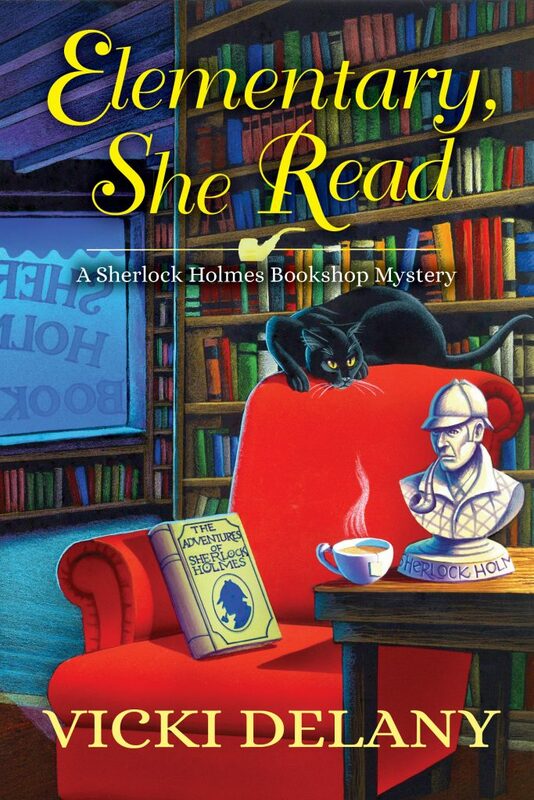 Elementary She Read is now available. Would you like to read an ADVANCE REVIEW COPY of Body on Baker Street, the second in the Sherlock Holmes Bookshop series, and find out if Donald does make a fuss? I have one copy to give away as part of the Killer Characters Summer reading promotion. Please leave a comment to enter, and remember to leave your email address so I can contact the winner. (Do you recognize the book in the window?) Contest closes evening of Monday July 3. US and Canada entries. Yes, I recognize the book in the window :) Thanks for the chance to win. Yes, it is the first book in the series. I, too, would love to own or at least work in a bookstore. It would be wonderful to be able to read all those books. dbahn(at)iw(dot)net. I'd never get any work done! I noticed that it's the first book in the series in the window. I am really looking forward to reading the second book and would love to win a copy. mcastor07 (at)gmail(dot)com. Clever cover! Love to read the next one! Thanks for the chance! Yes the book in the window is the first one in this fun series. Yes I recognize the book in the window! It was a great read. Thanks for the chance to win. Frauenb(at)aol(dot)com. Yes, I think it's awesome they did the cover that way. Looks like a fantastic read. So I am hoping. What a great way to tie everything together with the first book in the window. Love your attention to detail! The cover design wasn't done by me. But I love it. Would love it!!! Love cozies set in bookstores!!! Nice way to show both of your books in Sherlock Holmes Bookshop series. Thanks for part in this special month of giveaways. I sure do recognize the book in the window! Hope I win the chance for Body on Baker Street! Thanks for the chance, Vicki! I love all your books!!! Yes I certainly do! Thanks for a chance to win. I love reading mystery books! reading about book shops for that urge. thanks for the chance to try one of them. Yes, of course I recognize the book in the window! I still bet the upside to owning the bookshop beats the other! Thanks so much for your generous giveaway, I would love to win! Love this!!! The cover "hidden" easter egg is a great touch! Thanks for the chance to win too! I suspect being the owner of a bookshop isn't as wonderful as we think it would be. But we can pretend, can't we? That's totally cool having your first book in the window! I would love to win your book, thanks. It is pretty cool, I thought. Yes I did. Love the cover. I would love to win this book. Thank you for the chance. I have often dreamed of owning a bookshop! I suspect the reality is quite different from the dream. But it's always fun to pretend, isn't it. What a great contest! Particularly since I loved the first book and can't wait until September to read the second! I would LOVE to win and would donate my copy after read to my public library for cataloging. Glad you liked it Melissa. What a fun contest. Oh Yes..so cute the book in the window. Great touch having your first book featured on the cover of "Body on Baker Street". Would really enjoy reading the book. Got it! Cute!! Would love an ARC of it! Very clever to put the first book of the series in the window. Sherlock Holmes and bookstores just seem to go together. Thank you so much to you and all of the authors who have participated in this wonderful giveaway program. Thank you, Sue, and everyone for being interested in our books. There is something about Sherlock, isn't there? Yes, I recognize the book. Thanks for the chance to win an ARC of the second book in the series. Glad you liked it, Pat! I would love to win an ARC of the new book! It is so cool that the first book in the series is one the cover of the second book! Thank you so much for the chance to win! I think that would be my problem too, Robin. Thank you for the giveaway. I recognize the first book in your new series in the window, how clever! Would be a unique way keeping your books out in the public eye, every cover has the previous book cover showing somewhere. I'd spend way too much time reading if I owned a bookstore. Thanks for the contest. Thanks, Kimberley. I'm glad you liked it. That is so cool putting 'Elementary, She Read" in the window!! are always so fun and interesting.